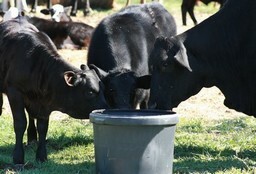 Having nutritional supplements always available for your cattle to utilize during critical times, can pay dividends. Not meeting nutritional requirements of heifers and cows during the last third of pregnancy and the first 60 days of lactation, for example, can cost producers great economic loss, according to an Ohio State University Extension Fact Sheet on winter supplementation of beef cows1. Results of University of Nebraska research, reported in the Journal of Animal Science in 2007, showed that strategically supplementing cows with protein while grazing dormant winter range late gestation not only positively affects the cow, but has lasting affects on their heifer calves weight and reproductive performance. The three-year Nebraska study showed that 88 percent of heifer calves from cows supplemented with protein during the last trimester achieved first-service pregnancy, compared with 45 percent of heifers out of cows that received no supplementation. This entry was posted on Saturday, March 10th, 2012 at 6:19 pm	and is filed under Cattle. You can follow any responses to this entry through the RSS 2.0 feed. Both comments and pings are currently closed.